Cozy holiday apartment in Sestri Levante, on the ground floor of a building 500 m from the famous" bays of silence and fairytales "that inspired Andersen and a short walk from the historic center of the beautiful Sestri Levante, typical Ligurian village with its intertwining of 'carrugi', narrow medieval streets full of history For the exclusive use of the guests a garden equipped with barbecue for outdoor lunches and dinners The resort is ideal to visit by train or boat the Cinque Terre, Portofino (30 km), or to practice one of the many water sports and not, such as diving, wind-surfing, fishing, deep sea fishing, snorkeling, horseback riding, trekking, some suggestions for your excursions: visit the quaint old town with a pedestrian area between two bays and 'isthmus, or the magnificent natural park of the Cinque Terre. For those who love to venture into nature, in Tavarone (18 km) there is an Adventure Park with its cable car or trekking trails in Punta Manara (6 km) Finally, at only 26 km you reach the Varese Ligure Biological Valley - the first European municipality with an organic certificate. 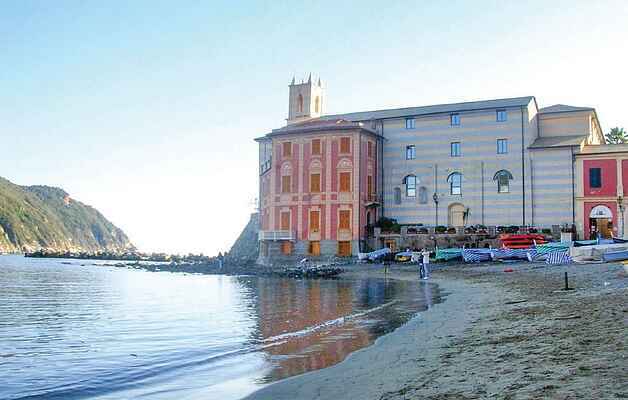 There are numerous festivals and events taking place in this area: the Palio Marinaro del Tigullio between June and August, the Barcarolada with the most original boat award, the Torta dei Fieschi, a medieval parade that takes place in the nearby town of Lavagna. Following additional services are possible on request and upon payment: family trips with tastings in Genoa, trips to Cinque Terre, Riviera di Levante, Portofino and San Fruttuoso, urban trekking in Genoa or naturalistic excursions in the Cinque Terre and Portofino, trips to Noli and Finalborgo, horseback riding, boat trips, food personal shoppers, private transfers, motorboat and dinghy rentals, car rentals or private drivers. Additional services at the accommodation: cooking lessons, tasting of typical products (wine, olive oil, focaccia, pesto, etc. ), babysitting, children's entertainment, dog sitter, organization of events and birthdays, Italian lessons, tasting lessons. We recommend early booking.